The 2-foots are STILL glued to the stupid light up box with the pictures on it. This Fame Academy thing has got so bad now that the 2-foot with no fur on top of his head has actually started joining in. The people on the box were trying to sing a song, and were getting it wrong, so he went upstairs and got this wooden thing that he has with wires streched along it. When he plucks the wires, it makes a noise... Anyway, I was telling you, he was making a noise on this thing just to try to prove that he was somehow better than the people on the box, IT WAS PATHETIC! My wonderful Flopsy Girl however came up with a plan (she's really good at that). She did a huge pile of stinky poo, and sat in it till it was well and truly stuck to her bottom. Of course then the stupid 2-foot had to start paying us some attention, he had to go upstairs with Flopsy Girl and give her a botty bath, which strange to say, she REALLY enjoys. Well done Flopsy girl :-) What a way to get the 2foots attention - I will have a word around the mob to keep that one in mind. Don't know about enjoying a botty bath though! Seems rather strange to us. I don't know what that wooden thing with wires was - I can't even begin to think - did that make a worse noise than your 2foot? I dread to think! My dad tries to hum now and again - pah! - let you into a secret - you should hear him try to whistle - a baby could do better :-) He thinks he's good though so we go along with it. How's Flopsy girls bott now then? Still clean I hope. Speak to you soon - am going to dig out all the food in the bowls so that mum has to get down and pick it all up :-) I love chinning her slippers while she kneels down and she just giggles at me! It's funny, myself and Mister Jingles had a botty bath last night as well. Like Flopsy Girl I don't mind the bath, but Mister Jingles ... oh that's another story. I love to see our 2foot coming back into our room looking worse than Mister Jingle does. But we do say "well done" Flopsy Girl ... Erm, and how's the bott-bott now? Right, I'm now off to tip all the vegetables out of the vegtray, Mister Jingles is looking at Loppy to see if there's a chase brewing and poor Tigger is still behind bars. I don't think it's punishment, its just Tigger is rather new to our group and even though I love to wash him, Mister Jingles and Loppy have other ideas. Bye for now (hope the wooden thingie is not used again). Flopsy Girl is 3 years 3 months old (I just love experienced older women). She is a dwarf lop, so she is just a tiny bit bigger than me as I am a satin. Flopsy Girl is really fluffy and cuddly, and she is a grey and white with butterly markings on her nose. I think she is the prettiest rabit in the world. This has been a really good summer for us, as one of the 2-foots has been at home most of the time, so we have had lots of freedom, and lots of time to spend in the garden. When we are not running about we like to find a spot out of the way. like under the table, and just lay down and watch the 2-foots being stupid.... I mean what is it with them? they are so disorganised! They seem to spend their whole time running about and worrying about things, and then when they do finally settle down and look at the light up box in the corner, they usually end up falling asleep. That's another thing. They don't do like we do and just sleep for a few minutes, they sleep for hours and hours and hours. What a waste of time. It's a good job that we have lots of toys with bells in them so that we can wake them up whenever we want to. As I write this, I am still chewing some cabbage from a HUGE basket of greens that my 2-foot brought us. There were carrots from the garden, a bag of salad, spring cabbage, kale, fine beans, toast and herbs..... That's the life! Today, I want to talk about windows. Not the kind that you use on your computer, or even the ones that are inthe house, no I would like to ask if anybun knows why the 2 foots put windows in front of their eyes? As you know, I have two pet 2-foots. One is a female who always balances small windows on top of her nose and peers through them, and a male who up to now has hardly used these windows at all, but now seems to be using them more and more. Now I can understand why they would want to look through the house windows, as that way they can see the garden, and then they can see if the weather is nice enough for us all to go and play outside, but let's be honest. If you put small windows in front of your eyes, they are not going to let you see anything that you are not already looking at, so why bother? I'm worried about my 2-foots. I would hate to think that they were getting so stupid that they would forget to feed us, or to clean our house. If anybun has any advice. or if you know why the 2-foots might be acting so irrationally, then I would REALLY appreciate it. Well, good evening Dandy - see that you are keeping well as is Flopsy Bun :-) Now about these window things - I had a word with the mob and we have come to the conclusion that these things are called Glasses - not the ones that you often see your 2foots drinking out of - but ones that go on the nose to see through. I have it on good authority (Violet) that these things are put there by 2foots because their eyes are getting old :-) Next you know they will be using something called a hearing aid and using a walking stick! Mum often says something about using a zimmer frame when she hears the radio people talking and they say about the fitness of an old trouper like Alec Stewart!!!!! Anyway, back to these glasses/windows - we want to know how they don't have window wipers on them 'cos when they get wet it must be dangerous! In my opinion Dandy old boy - my 2foots need glasses - they can NEVER see where I am and I am constantly having to avoid their feet! They blame me for running around and getting in their way - pah! It's their own fault for not looking properly so me and the mob have decided that we shall save up and get some of these glasses things for them. Any idea where we can purchase such things and how much they would cost? So.... I have it on good authority (see comment to previous entry), that the windows that the 2-foots put in front of their eyes are to help them see better. Well I'm all in favour of that. If it helps my 2-foot to see that we are always hungry, and that he should feed us non-stop, just pausing long enough to give us a stroke and some fuss now and again, then I think that they are an essential investment no matter what they cost, although I don't think that my 2-foot has got the hang of his yet, as he is not feeding us any more than usual. Still, give him time I suppose.... I'll give him another hour, and if he has not mastered them by then, there will be TROUBLE. Oh so that's where our 2foot is going wrong, she doesn't wear these glasses things often only when she needs to use our computer. I wonder how we can get her to wear them all the time so we can maybe have food more often. I say Dandy old Chap - any luck with the food yet? Would be interesting to know as we can hurry up the order for our 2foots glasses! I've just woken up from a nice snooze on mum's chest - by the time I was ready to go back on the floor again her meal had gone cold :-) Serves these 2foots right for saying things in front of us - she always says "If Mr Jingles/or whoever wants, then Mr Jingles/or whoever gets" - hee, hee, we always remember that one - do you use that one by any chance? Monday giggles from Mr Jingles and the rest of the mob. I'm in shock. Almost the worst thing possible has happened, my 2-foot has got a job. This means that he will no longer be able to play with us all day, and that he will have to leave us alone again. I'm too gutted to write any more just now. Oh dear ... erm ... there's two ways of looking at this, one being that you and Flopsy Girl will no longer have the attention (not good), but the other way your 2foots will now have more money for .. MORE food .. MORE treats for you and Flopsy Girl. That's how we would look at it. Plus you will more than likely get twice as much attention upon their return in the evenings. If not cause mayhem! PS - We notice there's another Mister Jingles which also comments .... Hi yer. Let me introduce myself - I am Mr Jingles and I live at Ebony-Eyes Rabbit Retirement Home in North Wales. 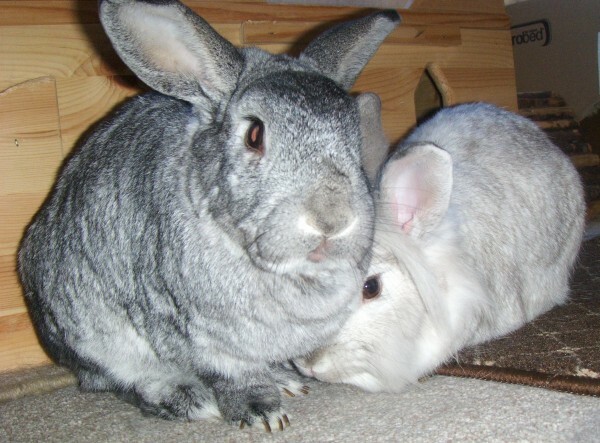 My 2foots take all kinds of elderly and disabled buns and I have got 28 brothers and sisters here. Being the eldest - but of course the brightest and handsomest (is that a word?) - I do the writing for the mob. Of course I am the most educated as well so it's best that I write as some of the buns can't spell too well - eh what! I am going to be 12 years old beginning of next year and although I do say so myself, I don't look a day over 12 months! Fit as a fiddle and such a dreamboat too - but then again, I am also very modest and shy! I am a netherland dwarf and for 10 years I was a stud buck with a breeder - when I reached the age of 10 she dumped me at a rescue! Well really, as if I couldn't give of my best any more <wink, wink> - anyway, it's the best thing that happened to me 'cos my mum got to hear about me and I travelled all the way from London to be with her and dad. Marvellous people they are - they let me do whatever I want - well almost, they won't let me alone with the girlies! I was just called Jingles at the rescue but mum said that due to my age I should be called Mr Jingles and I have to say, I agree with her wholeheartedly - one has to teach these younger buns manners etc. Tatty bye for now and hope to hear more about you all soon. Now, now Dandy my lad - take it easy. Take deep calming breaths and think nice thoughts. Calm down and lets talk this through rationally. Firstly, big congratulations to your 2 foot for getting a job :-) Now it is nice for him when you think about it as he'll be able to tell other people all about you and Flopsy girl :-) You would of course, become even more famous as people flock to read your journal. The best thing to come out of this job would be - more food and more treats :-) Think about it - jobs mean more money - more money means more to spend on you and Flopsy - you could write a list of things that you would like and 2foot could get them 'cos he will feel guilty by leaving you. Now you know that you will be nice and safe and you can really milk the guilt trip here - 2foot will be thinking how bad he is feeling leaving you all day when most of the day you would be snoozing anyway. 2foot won't realise that 'cos of the guilt and he will make extra fuss of you at home times and weekends :-) You could think ahead and plan christmas - think of the money he could have and how many things that you could order off the bunny shops! Oh yes, you make sure that 2foot does not forget to let you write your journal - we will not stand for it if you go and leave us up in the air! Your journal keeps us (the mob) sane and at least we know that we can vent or advise when we can. And another thing to think about - thank goodness that your 2foots chose you to come and live with them - you could still be at the rescue - nice though it was it doesn't compare to home now does it? The mob are sending you courageous vibes. Tally ho for now Dandy, regards to Flopsy. My 2-foot must be feeling REALLY guilty about starting this new job, as he has just bought me & Flopsy Girl a fantastic present. He has bought us a brand new cardboard castle to play in (you can find a picture of in at www.bunnymail.co.uk). We had an old castle, but it was well chewed, and a bit dusty, but this one is FANTASTIC! Oh wow, I shouldn't really say this but we've got one of those cardboard castles coming. The only problem is it's going to be our Christmas present. CHRISTMAS PRESENT! There's no way we're waiting 'til Christmas. I must call a meeting with Mister Jingles, Loppy and Tigger to see if we can get our 2foot to make it up NOW, any ideas? See, what did I tell you? Now then, they are going to be buying all kinds of treats and toys now - mind if I come visit? I think I may have to work on my 2foots to get me a castle - I know that I am only little and everything but I think I would look rather good in a castle - what do you think? Any ideas how to go about getting one? When does the 2foot start work? I know that my 2foots have been talking about the test or something tomorrow - maybe they are going for a job and they have to take a test!!!!! Oh dear, I don't think the mob would be too happy with that. I've gone and frightenend myself now! Calm down now Mr Jingles, you will do yourself an injury. It's all right now Dandy - I usually talk to myself when I get in this state - it makes me relax a bit. No, I can't see the 2foots going to get jobs - they say that there is not enough time in the day now - don't know what they mean! Still wonder what this test is though! I just have to tell you how proud I am of Flopsy Girl. I mean to most of us, housework is a chore, but Flopsy Girl just loves it. Ever since our 2-foot brought us the new castle, Flopsy Girl has been inspecting it, and giving the inside a good chewing to make sure that all of the dors and windows are just the right size and shape. I've not seen much of the 2-foot today, he's been gardening, and he had a bonfire. He does not let us play out when he has a bonfire, as he says it is too dangerous. I don't see why though, he's big, clumsy, and stupid, and he manages all right with it. The one good thing about him doing the garden, is that he brought us some carrots and some dandilions (our favourite), so I suppose that makes up for not going outside. Glad to hear you and Flopsy are enjoying your new castle. Dare I say "Your Highness?" ... Do you think your 2foots might go crazy and spread that white stuff on your castle like they did outside their home? Now this just isn't on! My 2-foot has decided that he is going out tonight, and that he will not be back until tomorrow afternoon. WHAT DOES HE THINK HE IS PLAYING AT? This means that me and Flopsy Girl are going to have to go to bed early. HOW DARE HE. Apparently, it has something to do with what the other 2-foot arranged for him months ago. I have no idea at all what this means, but apparently, he is going to be driving a single seater racing car round a circuit tomorrow, or at least that is what he said, although what that means I have not a clue. I'm not even sure what lanuage it is, but if it's anything like the other stupid things that he gets up to, then I'm not sure that I want to know anyway. Like I told you before, my 2-foot left us all last night and all this morning, but when he came back this afternoon, he brought a HUGE cardboard hose with him. I thought that the castle was good, but this is even better. It isabsolutely FANTASTIC. it has 2 floors, lots of windows, and a tunnel that you can run all the way through. It's then best toy we have eveer had! It sounds like two bunnies are getting rather pampered. Gosh! How lucky. I know our 2foot loves us very much, but she still hasn’t given us our castle. 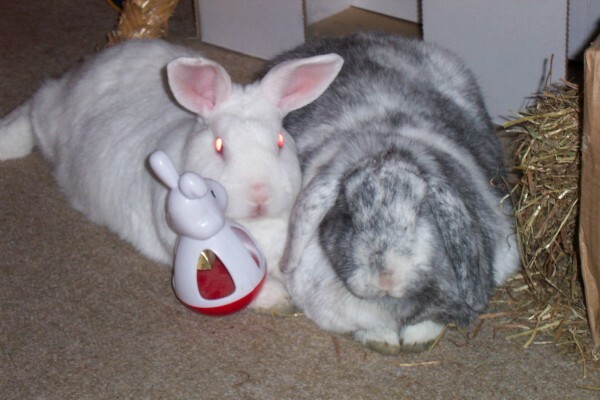 Oh, I don’t know if I can hold out ‘til Christmas - Mister Jingles and Loppy are the same. Tigger on the other hand is rather relaxed ... what’s going on? Does he know something we don’t? Arrh! That sounds a lovely idea. I am sure your 2foot will appreciate that after working hard. We hope the day goes well. See all that worrying; never mind. We have been getting extra fusses to. As Tigger is the new one our 2foot doesn't trust us with him all day (wonder why), so he only comes out during the evenings. Last night we made extra special attention to Tigger, I washed him and then Loppy came over to inspect - we got lots of hugs for this. Mister Jingles at present is having none of it and stays out of the way. Therefore in my wisdom I think this is why we can't have the castle yet - when we all play together then and only then can we have the castle. I must have a word with Mister Jingles, he's letting the side down. Those 2-foots are funny that way! They make such a fuss when they get home. It's nice ... pats and strokes, scratching behind the ears, treats and all that! Haven't gotten a castle, though, like some lucky buns. Now I just have a few sheets on the floor for padding because my 2-foots saw I can't hop as well into the cage anymore. My 2-foot needs cheering up. Well anyway, he seems to really like it. He says that there are rabbits running about all over the place, and he can see them from his office window. Also, at lunchtime, he can walk to a place called Harlow Carr Gardens, which sounds good to me, because if it's anything like our garden, then there will be lots of nice things to eat in it. However... there is always a however...... Right next to where my 2-foot works, there is a laboratory (I'm not sure what a laboratory is, but it sounds horrific), anyway, in this laboratory, they have rabbits who never get any exercise, there is nobody to look after them, and they do horrible things to them. Apparently, every so often, some 2-foots come along, and shout at all the other 2-foots who come out of the laboratory and call them names, which is fine if they are doing horrible things to the rabbits. The problem is though, the 2-foots who are doing all of the shouting, don't know who the laboratory 2-foots are, and who the 2-foots are that just work door and have nothing to do with all of the bad things that are going on, so they shout bad things at everybody. Tonight, when my 2-foot was coming home, these shouting 2-foots said some really horrible things to him and called him all kinds of nasty names, which made him very upset, as he does anything he can to help ALL rabbits (which often makes me jealous, but then again, I can't really complain, I know he loves me best of all). I just wish that all of the 2-foots could be more sensible, I mean I'm sure that there is no justification for any 2-foot do do horrible things to rabbits, and I'm also sure that the 2-foots who do the shouting are trying their best to stop the nasty things from happening, but it's not fair that they shout at my 2-foot, because he would NEVER hurt a rabbit. Firstly, best wishes to Bunny Bunny from us in Tiptree, Essex. Secondly, about this shouting the 2foots are doing. I have heard about these laboratories - not nice places. Unfortunately the 2foots which think are doing justice sometimes get too carried away. It is a shame to read your poor 2foot got blamed for the cruel goings-on. Hopefully the mix-up will not happen again, but if it does you and Flopsy Girl will need to give extra special fusses to your 2foot. Take care from Thumper-Binx, Mister Jingles, Loppy and Tigger. I just had a comment from my very good friend Bunny Bunny in Oregon. Bunny Bunny is very old, and is getting a bit tired now, and can't hop about as well as he used to. Would all of the other buns who read my journal please send him your very best wishes? However, it would appear that BOTH of our 2-foots are staying out all day tomorrow, and will not be home until late at night, AND IT'S ALL UNCLE RANDY'S FAULT! I think we should have 3 carrots to make up for this appalling behaviour. Too right. We're behind you all the way. Whenever our 2foot is going out for a long time, we all get extra treats and we mean EXTRA. ... Why doesn't she go out more often???? Bye-bye, Thumper-Binx, Mister Jingles, Loppy and Tigger. I'm very pleased to report that we got the extra carrots (sometimes I'd SWEAR that my 2-foot actually reads this journal, you know I'm sure that he understands every word that I say!). When the 2- foots came home on Saturday, one of them stayed up with us ALL NIGHT, so we got to play and play and play. Sunday was a nice day too, and although the 2-foots went out for the afternoon, we were left to play out in the house. Apparently, one of the 2-foots (the one with the fur on top of her head) had a birthday yesterday. Flopsy Girl says that they are a lot older than us, and that they may even be 10 or even 15 years old, can you imagine that? I didn't know they could live that long. Flopsy Girl and I have suspected for some time that there are rabbits living outside in the great outdoors with nobody to look after them. It would seem that our suspicions are correct. Last night, we overheard the 2-foots talking. They were saying that there were a lot of DEAD RABBITS IN THE ROAD!!! I wonder what is going on, we are both terrified. What is killing the rabbits? is it safe to go out in the garden? One of the 2-foots said that the rabbits had been "run over", but I don't understand that, I mean both of us can run a lot faster than the 2-foots, and we sometimes even run over each other, but that has never hurt either of us. I'm worried about this new discovery. Hello - it's funny you should mention this, we heard our 2foot talk about this a few weeks ago. I haven't yet found what is going on, but I do think it's safe to go out in the garden. All I know it's something to do with a box type thing which makes a noise and moves along without having to walk or run??? I'll keep you posted. Bye for now - Thumper-Binx, Mister Jingles, Loppy and Tigger. I might be able to throw some light on what the box thing is. Not only have me & Flopsy Girl seen one, we have been in one! Whenever our 2-foot takes us to the vet, he opens the box thing and we all get inside. It then just seems to glide along very quickly. Do you think that the box things are running over the rabbits? Do you know, I think I've been in one as well? I'm pretty sure I have. Being blind (I can touch-type you know) and my memory not quite what it used to be I'm finding it hard to remember, but I'm pretty sure ... yes, I have been in a box thing with wheels. Anyway getting back to the debate. I don't want to be judgmental, but .. yes .. I think it is these box things with wheels which are unfortunately killing our distance relatives. And from what I can tell, some 'sick' (I think that's how our 2foot calls it) people get enjoyment out of it. Why? What have 'we' ever done to them? Oh, I'm getting quite angry and upset now; I'll have to lie down. Take care my dear friend and hugs to Flopsy Girl - Thumper-Binx, Mister Jingles, Loppy and Tigger. How am I supposed to get any sleep? It started out well enough..... One of the 2-foots said that she would sleep downstairs last night so that we could play out for as long as we liked. The problem was, when we did decide that it was time for a bit of shut eye at about 2am, she was snoring so loudly that we could not sleep a wink! we had to keep making a noise to wake her up so that then we could try to get to sleep, but that did not work, as she went back to sleep and started snoring again within seconds! Hopefully, you will have a good nights sleep tonight. Paws crossed. Bye and sleep tight - Thumper-Binx and gang. we hope your 2foots without fur on his head will be better soon . our 2foots are tired because they have too much work ,and I have a stone in my wee bag ,but you know what ? we are happy ,we have friends ...like you . take care about you all . Friends are very important, and you are very important friends. Les amis sont très importants et vous êtes des amis très importants.